Twenty-five years ago, on a moonlit night in May, I raised my rifle and looked through the optical sight to get a better view of the burned-out buildings on the far side of the town square. At night, an optical sight gathers the light and helps you see a little better. I took this photograph a few hours before I left on my own patrol. When I look at it, I still see routine. But that night, I’d be going on a patrol that would be anything but routine for me. (Canadian compound in 1993 in what was the Former-Yugoslavia and is now, Croatia). 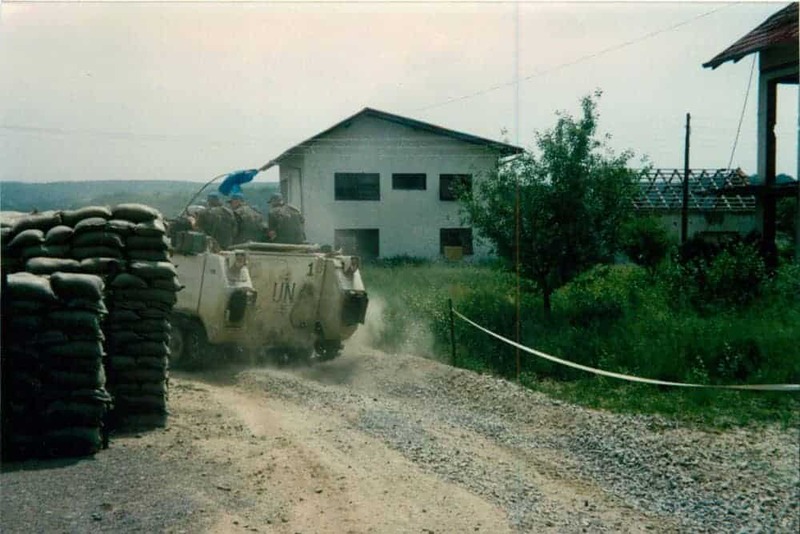 I was on a patrol with professional infantry soldiers in a country that is now Croatia, but back then we called it the former-Yugoslavia. Canada lost 23 soldiers in the Balkans, many of them to landmines. We lost four on my tour. how did my patrol go from routine to critical? Ethnic cleansing had made most of the town uninhabitable, but a handful people had returned to make a life. That takes courage, and we were there to protect them. Myself and another soldier had taken a position crouched behind a stone fence to watch the town square. Our Sergeant and another soldier had gone on a foot patrol around the burned-out buildings that surrounded the town square. They were supposed to be back in fifteen minutes. At twenty-five minutes, when they still had not returned, I stood up to get a better look around. The town was quiet. I strained my ears to hear footsteps. I strained my eyes to see movement. The Sergeant and the other soldier couldn’t be more than 100 metres in front of me. I should have been able to hear or see them. At thirty minutes, I looked past my watch to the Private who had been crouched behind the stone fence with me. He turned, and our eyes locked for a fraction of a second. In that fraction of a second, I felt a weight. I felt the air thicken. And, I felt my critical leadership moment. The Sergeant hadn’t come back. My patrol had gone from routine to critical and I had to get us out of there. That was 1993. I wouldn’t think much about that night until 20 years later, in 2013, when I had a leadership failure in the corporate world. At the Bold Summit in Calgary on June 13, 2018, I’ll be telling the rest of this story and how I believe leadership development in the corporate world needs to change. I’ll also post the rest of the story and a summary of the presentation in Part 2 and Part 3 of this article.